CONVENTION R E G I S T R AT I O N O N L I N E Registration for the 73rd annual NIADA | NABD Convention & Expo is now online! You don’t want to miss this industry-leading mega-conference! The event is June 17-20 at the Venetian in Las Vegas. Learn more and register today at www. niadaconvention.com. For advertising information contact: Troy Graff (800) 682-3837 or troy@niada.com. 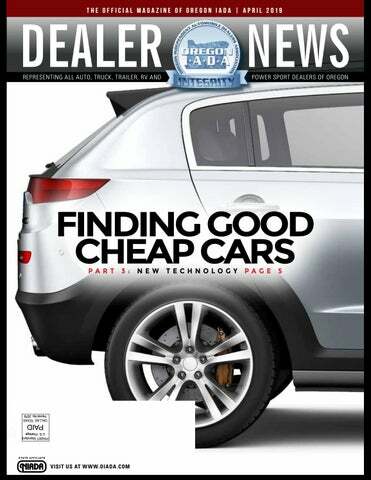 OIADA Dealer News is published monthly by the National Independent Automobile Dealers Association Services Corporation, 2521 Brown Blvd., Arlington, TX 76006-5203. Periodicals postage paid at Dallas, TX and at additional offices. POSTMASTER: Send address changes to NIADA State Publications, 2521 Brown Blvd., Arlington, TX 6006-5203. The statements and opinions expressed herein are those of the authors and do not necessarily represent the views of OIADA Dealer News or NIADA Likewise, the appearance of advertisers, or their identification as members of NIADA, does not constitute an endorsement of the products or services featured. 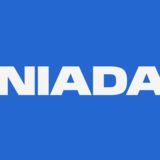 Copyright © 2019 by NIADA Services, Inc.
Volkswagen Group of America Inc. is recalling 845 2015-16 Audi A6 Sedans and 2015 Audi A7 vehicles. The auxiliary heater electrical connector on these vehicles may have been incorrectly inserted into the auxiliary heater, possibly resulting in increased electrical resistance. Volkswagen will notify owners, and dealers will inspect the auxiliary heater connector, replacing the auxiliary heater and connector, as necessary, free of charge. Volkswagen’s number for this recall is 82C1. a chirp. He quickly taps his phone, scrolls through a couple of screens, pounds out some numbers on his phone calculator, taps his phone one more time and gets back to our conversation. What was he doing? He was bidding on a car that was traded in at a new car franchise less than two hours ago. That’s right, sitting at lunch bidding on fresh trades and in the time it took to eat his burger, he owned the car! There are a few companies in this stillgrowing, dealerto-dealer digital auction space. I’m most familiar with ADESA’s sister company TradeRev, a mobile app that sends notifications to your phone as new car franchise dealers launch cars to a 45-minute on-demand, digital auction. You can view multiple photos, watch videos and even listen to the engine run. Settings allow you to customize your experience, enabling you to create alerts for only the types of cars you want – so you spend less time looking and more time buying. Think about the efficiencies this technology brings to the industry. With built-in artificial intelligence and machine learning, you can find the right car at the right price, in a transparent and fair process, all in about an hour. You can have funding, titling and transport pre-arranged in the app so when you win a car it quickly appears on your lot. And what about the seller? We know the longer you keep a car in stock the less gross you get – the dreaded “lot rot” is real. Even when you hit a home run on an aged unit, if you do the math on a profit-per-day basis, the ROI is weak at best. What would wholesaling a trade the same day it’s brought into inventory do for the average inventory turn time? It’s a win-win for both buyer and seller! The industry is changing, but so is the technology we use to run our operations. If you have not embraced buying cars upstream, live online from your PC, laptop or phone, or the newest app-driven one-hour, on-demand auction, you may want to rethink your business plan. I’m not saying you can’t continue doing what you’re doing now and be profitable. I’m saying there is technology out there that can and will help you be more efficient – which leads to higher profits with less effort. Mastering these new, high-tech systems and apps is so easy there is no reason not to give them a try. I’ll even help you get started. Email me at Doug.Hadden@ADESA.com and I will set up some time for training you on one or all of the new technologies discussed in these articles. Once you get comfortable using the new tech, not only will you be more efficient and profitable, you may also have time left over to do other things you haven’t been able to do, like spending more time with family and friends! Until next time – have fun and sell cars! Doug Hadden is executive director of dealer consulting services for ADESA Auctions Inc. He can be reached at Doug. Hadden@adesa.com. Not all Facebook pages are created equal. It’s hard to ignore the opportunities available with Facebook to attract, engage and convert car buyers, but building a high-converting Facebook page has been elusive for many. It’s important to know the elements of a successful Facebook page, and even more crucial to recognize the reasons your Facebook page may be failing. If you want your car buyers and their friends to notice, you have to continually reward them with great content and build an engaged community for them. This means employing a content strategy that works for your dealership both culturally and operationally. You also have to incorporate Facebook ads to promote your content and encourage clicks to your website from interested buyers. If consistent engagement and conversions on Facebook is a struggle for you, here’s a list of reasons your Facebook page may be failing, with tips to make it work for you rather than against you. YO U D O N ’ T P U B L I S H R E G UL AR LY Consistency is a cornerstone of Facebook (or any other) marketing. Users need to see your posts in their newsfeeds for you to stay relevant. It’s a battle right now for attention. Inconsistent posting (such as a few times per month) is not going to capture anyone’s attention. YO U R PA GE L A C KS T H E H UM AN TO U CH Fact: Facebook pages fail because posts focus on products instead of people. There’s often a complete disconnect from the human side. Content that demonstrates why people choose the business seems to be nonexistent on many dealership Facebook pages. If you approach Facebook with the sole mindset of selling, you will waste your precious time. Facebook is first and foremost a social network, not a billboard. YO U ’R E N OT U SI N G T H E 3- GEA R ED A P P ROAC H TO CO NTE N T Content marketing (messages that meet your customer where they are in their purchase journey) is a powerful tool for driving qualified leads. The challenge lies in producing highquality, original content on a consistent basis. Content must reach each of three stages of the buying cycle: • Entertain. Most people who engage with your page are not immediately “in-market.” The inability to engage this large segment of users is where many pages fail. • Educate. Fans who are thinking about a purchase, or who have friends who are, appreciate answers to their questions. • Excite. Facebook posts and ads need to provide offers worth the prospect’s time. Exciting content compels people to click in anticipation. you’re looking for a competitive advantage, consider designating a “community manager” to oversee your online channels. YO U H AV E N O D E FI N E D G OA L S High-converting Facebook pages have clear, well-defined marketing goals. At Kruse Control, we begin with an outline of three goals and then build out the specific strategies that help a client achieve them: • Attract. Likability and relevancy are huge in attracting new and existing customers to your Facebook page. Add value to their lives by delivering awesome content. • Engage. Many dealerships fall flat when determining what to do with their fans once they become connected. • Convert. Attracting the right audience and engaging them lays the groundwork. Drive conversions using ads that provide valuable information that helps them finalize their purchase decision. YO U ’ R E N OT L E V E R A G I N G T H E P OW E R O F FA C E B O O K A DS Facebook has become one of the most powerful platforms to generate sales leads. Dealership Facebook pages fail because they either aren’t using Facebook ads correctly or they’re not using Facebook ads at all. No Facebook page will be truly successful without Facebook ads. Why? It’s simple: you must pay Facebook to reach car buyers. YO U ’ R E N OT M E AS U R I N G A N D A N A LY Z IN G YO U R R E S U LTS You can’t manage what you don’t measure. Dealers who don’t review their Facebook results are doomed to repeat their mistakes over and over again. Facebook Insights (your page analytics tool) gives you all the metrics you need to judge how your page is doing. You can see which content got the most organic and paid interaction, what you did right, and what didn’t work so well. Facebook Ads Manager gives you up-to-theminute stats on how your ads are performing. Analyzing results lets you: • Deliver a better experience for fans and the public. • Make better decisions on your content. • Tweak as you go to improve ROI. • Determine if you’ve reached your goals. If you’re not getting the results you want, compare your page’s components to these 10 reasons and see where you can improve. If your page doesn’t size up and you need help to improve, feel free to contact me. Kathi Kruse is an automotive social media marketing expert, blogger, consultant, author, speaker and founder of Kruse Control Inc., which coaches, trains and delivers webinars focused on integrating social media and online reputation management into dealership operations. She can be reached at kathi@ krusecontrolinc.com. Unfortunately in the used car business, your reputation after the sale can sometimes be out of your hands. Once that aspect of your business is out of your control, you need to be sure it’s protected in the hands of someone you trust. If you’ve been in the business long enough, you know that despite the best reconditioning and the best inventory selection, you’re bound to run into vehicles that encounter issues after the sale. When this happens, it’s your reputation on the line. How these fragile situations are handled can have long-lasting impacts on your reputation in your market. Partnering with a service contract provider that has the tools in place to take care of your customers the way you’d want them treated is perhaps the most important thing you could do to protect your reputation when your customer’s experience is out of your control. That’s why you need to know some specifics about what your service contract provider has to offer so you can be sure your customers are in good hands after they drive off your lot. Coverage Lookup A simple online coverage lookup tool is a great way for customers to learn details about their contract on a moment’s notice. Whether it’s start or end mileage, expiration dates, component coverage or a look at the contract itself, having this in place helps customers know exactly how they’re covered. Find a Shop A customer’s nightmare is a mechanical breakdown far away from home. A nationwide network of service facilities is one thing but being able to easily find a shop in an unfamiliar area is another. This online application takes the worry out of an out-of-town breakdown. Quick Answers These days, consumers demand answers, and they demand them quickly and on their terms. Having a service contract provider that allows customers to submit questions via online forms, live chat or social media gives customers multiple options, so they can get answers in whatever way suits their busy schedules. Good Reviews Online reviews in today’s automotive industry are vital to success. The same goes for service contract providers. Stick to trusted sites like Google (sometimes hidden in the maps section), Facebook, or Consumer Affairs and look beyond just star ratings. While overall ratings are important on the surface, looking at how often a service contract responds and the frequency with which customers leave reviews will give you a sense of how that provider cares for your customers. personal phones.” I cringe. Think about it, would you utilize your salesperson’s personal phone number when advertising on the web or in television commercials? Would you give each employee a copy of their entire CRM activity when they leave your dealership to work elsewhere? That is precisely what you are doing if you do not have a product that allows you to store, monitor and control all SMS activity. It doesn’t matter whether it is sales or collections. You need to retain and control those conversations for a host of reasons, not the least of which is compliance – but that is a topic for an entire article itself. If you want to eliminate – or at least greatly reduce – the wasted time and effort of phone tag, implement a well thought out customer contact strategy where SMS communication is your first form of communication. You will be amazed at the impact it will have on employee productivity. It is an incredibly effective way to communicate with your customers. In my opinion, it is even more effective in collections or service, where you already have a relationship with the customer. Studies show SMS messaging to be the preferred method of communication of most customers, across virtually every demographic. It is hands down the most efficient mode for just about every conversation. Chris Leedom is the CEO and founder of the Leedom Group. The Leedom Group includes Textmaxx Pro, a complete SMS messaging solution for small to medium businesses with a custom design for the automotive industry. You may reach Chris at chris@leedomgroup.com. for men, women and children at Portland Rescue Mission’s three locations: Burnside Shelter, The Harbor and Shepherd’s Door. Bradley’s life has changed 180 degrees. He graduated from the New Life program and is now employed at Drive Away Hunger as a mechanic. Bradley got married and is a proud grandpa. Reflecting on his time in the New Life program, Bradley remembers that when he came to train at Drive Away Hunger, “I couldn’t change oil. Now I am a mechanic. This gave me what I needed to begin the journey out of where I was.” For more information about Drive Away Hunger visit www.DriveAwayHunger.org. Jeff Martin (left) and NIADA’s Shaun Petersen (second from right) met with Speaker of the House Nancy Pelosi and Rep. Henry Cuellar. t NIADA and used car industry leaders visited Capitol Hill for a series of meetings with legislators and key committee staff. NIADA is your voice in Washington D.C., advocating for independent dealers, the used vehicle industry and small business. Here’s a look at the latest news and NIADA efforts regarding legislative, regulatory, PAC and grass roots activities. PAC NIADA met with the Speaker of the House of Representatives, Rep. Nancy Pelosi (D-Calif.), on Feb. 21 in San Antonio, Texas. The meeting was arranged by Rep. Henry Cuellar (D-Texas), a longtime friend of the independent used vehicle industry and a featured speaker at the NIADA National Policy Conference in 2016. Texas IADA executive director Jeff Martin and I attended the event, which also included Rep. Joaquin Castro (D-Texas). The group was small, allowing us an ample opportunity to speak to all three legislators about the used vehicle industry and explain NIADA’s positions on some of the issues affecting it. Five days later, members of NIADA’s executive committee, legislative committee and Buy Here-Pay Here commission traveled to Washington for a series of Congressional meetings, sponsored by PassTime. It began Feb. 26 with an event for Sen. John Cornyn (R-Texas) that drew more than a dozen senators, including Senate Majority Leader Mitch McConnell (R-Ky.), Sen. Ted Cruz (R-Texas), Sen. Jerry Moran (R-Kan.), Sen. Susan Collins (R-Maine), Sen. John Thune (R-S.D. ), Sen. Lamar Alexander (R-Tenn.), Sen. Marsha Blackburn (R-Tenn.) and Sen. James Lankford (R-Okla.). We were able to speak with all of them about our industry and our issues. The next day we met with freshman legislators as well as new committee chairs and ranking members of the 116th Congress and discussed issues expected to be considered during the next two years, including recalls, CFPB reform, privacy issues and tariffs. The NIADA group met with the members of the House Financial Services, Energy and Commerce, and Transportation committees, and the Senate Banking and Commerce committees. REGULATORY More than 7 million people were at least 90 days delinquent on their car payment at the end of 2018 – an all-time high and more than a million more than in 2010 – according to a report from the Federal Reserve Bank of New York’s Center for Microeconomic Data. The New York Fed called that number, based on data from Equifax, “surprising” considering the strong and growing economy and shrinking unemployment. But in a post on the Liberty Street Economics blog, Fed economists Andrew Haughwout, Donghoon Lee, Joelle Scally and Wilbert van der Klaauw pointed out there are more delinquencies than ever before in part because there are more total borrowers than ever before. More than 89 million people now have some form of auto financing, the most on record since the Fed and Equifax began compiling that data in 1999, with a total balance of $1.27 trillion, another record. “With growth in auto loan participation, there are now more subprime auto loan borrowers than ever, and thus a larger group of borrowers at high risk of delinquency,” they explained. And they noted the quality of borrowers is trending upward, saying, “2018’s strength in auto loans was primarily driven by those originated by the most creditworthy individuals, while originations to those with scores below 720 have leveled off, albeit at high volumes.” The large volume of loans, they said, caused a “quality shift,” as borrowers with credit scores better than 760 accounted for 30 percent of the outstanding debt. Only 22 percent was originated to subprime borrowers. “These percentages would suggest the overall auto loan stock is the highest quality we have observed since our data began,” they said. LEGISLATIVE Executives from Equifax, Experian and TransUnion were called to testify before the House Financial Services Committee, which is considering changes to the credit reporting system. The committee noted it has been 15 years since the issue of credit reporting has undergone “comprehensive reform” at the federal level, and cited Equifax’s massive 2017 cybersecurity breach in asserting “there are numerous shortcomings with the current system that need to be addressed.” In his testimony, TransUnion president and CEO James Peck said the U.S. economy provides more “quick and straightforward access to credit” than any in the world, and he offered the committee six ways the credit reporting process could be improved, calling for more timely updates of critical credit events, establishing new standards for reporting student loan data, increasing the number of Americans able to access credit, helping improve scores and access to credit innovations, protecting Social Security numbers and enhancing financial education. GRASS ROOTS A report by New Jersey’s State Commission of Investigation alleging widespread wrongdoing by “predatory” used car dealers has spawned a pair of bills in the state legislature aimed at tightening regulations in the industry. The report focused primarily on “multi-dealer locations” – locations that provide an address for “dealers” who do not have a lot or who operate in other states. The report described them as fronts for shady operators to obtain a dealer license. Assemblyman Paul Moriarty, the bills’ primary sponsor, said the report showed “the New Jersey used car industry – specifically the multi-dealer locations – is rife with fraud and deceit and in some cases unlawful activity.” One of the bills would prohibit “as is” sales in the state, increase the limitations of the implied warranty on used cars and require dealers to offer contract cancellation options. The other would transfer licensing and enforcement power from the state’s Motor Vehicle Commission to the Department of Consumer Affairs in the attorney general’s office. Shaun Petersen is NIADA’s senior vice president of legal and government affairs. 0030(1)(b), which requires vehicle dealers to provide a means for the public to contact the dealer or an employee of the dealer at all times during the dealer’s normal business hours. Additionally, the proposed amendment will provide DMV with the dealer’s normal business hours so DMV can conduct unscheduled administrative inspections during the timeframe when the dealer has identified themselves to be open to the public. 735-150-0010 Definitions As used in this division and ORS Chapter 822: (1) “Additional (or supplemental) place of business” or “additional (or supplemental) location” means a location, other than one exempted under OAR 735-150-0020, that is more than 500 feet from any other business location of the dealer that is operated under the same name as the main business location. (2) “Advertise” means to offer a vehicle for sale or to communicate to the public that a person is acting as a vehicle dealer by any oral, written, or graphic means including, but not limited to, handbills, the Internet, newspapers, signs, television, billboards, radio, and telephone directories. (3) “Agent” means any dealer possessing a current valid vehicle dealer certificate issued under ORS 822.020, who accepts applications and fees for the titling and registration of vehicles sold by the dealer and who performs such other duties related to the titling and registration of vehicles as DMV authorizes under the rules set forth in division 150. (4) “Applicant” means a person that applies for the issuance or renewal of a vehicle dealer certificate under ORS 822.020, 822.040 and these division 150 rules. (5) “Broker” has the same meaning as “motor vehicle broker” as defined in ORS 822.047(1). (6) “Brokerage services” has the same meaning as defined in ORS 822.047(1). latest revision, dated 4-18. Chapter F, Ownership Documents – The Oregon Certificate of Title, revised 1-19, has been added to the chapter. This title is printed on 8½-by-11-inch paper, but the page is perforated. The actual title is 8½ by 8½ inches. Chapter H, Odometer Disclosure Requirements – The Power of Attorney, Form 500, has been replaced with the latest revision dated 4-18. Chapter I, Security Interest Perfection – The Transitional Ownership Document (TOD) date chart has been replaced for 2019. Chapter J, Damaged/Totaled Vehicles – The Oregon Salvage Title Certificate, Form 417, has been replaced with the latest revision dated 1-19. This title is printed on 8½-by-11inch paper, but the page is perforated. The actual title is 8½ by 8½ inches. Chapter K, Registration – The Application for Registration, Renewal, Replacement or Transfer of Plates and/or Stickers, Form 268, has been replaced with the latest revision dated 1-19. Newer Model Year information has been updated to show current dates as they relate to 2019 for DEQ determination. The Certification of Oregon Residency or Domicile, Form 7182, has been replaced with the latest revision dated 9-18. The 2018 Legislature approved the Special Registration Plate Program. The Gray Whale plate is part of this program. These plates may be issued to passenger vehicles only. Passenger vehicles may be issued custom plates with the Gray Whale plate background. The Custom Plate Application, Form 205, has been replaced with the latest revision dated 2-18. The Application for Amateur Radio Operator Registration Plates, Form 231, (Ham Plates) has been replaced with the latest revision dated 5-18. Chapter L, Vehicle Types – Ham radio passenger plates may be issued on Special Registration Plate Program (Gray Whale) backgrounds. Chapter M, Fees – Special Registration Plate Program fees have been added to the chapter. The Heavy Motor Vehicles and Buses Fee Schedule, Form 6013, has been replaced with the latest revision dated 11-18. Chapter P, Dismantlers – The indicator “In Dismantler Stock” has replaced the Flags 35 and 38 in the DMV system. This indicator is added to the vehicle record upon receipt of a Dismantler’s Notice, Form 270. The Dismantler’s Vehicle Notice to Driver and Motor Vehicle Services, Form 270, has been replaced with the latest revision dated 10-18. Chapter R, Dealers – The Notice of Sale or Transfer of a Vehicle, Form 6890, and the Dealer Notice of Vehicle Purchase, Form 165, can be submitted to DMV by accessing DMV2U. Information about DMV2U is in another Dealer Details article. The Dealer Notice of Vehicle Purchase, Form 165, has been replaced with the latest revision dated 12-18. Index – The index has been updated to remove Chapter T, Flags. References to the Special Registration Plate Program, including the Gray Whale Plate, and DMV2U have been added to the index. of more damages, including attorney’s fees, where a breach of contract will be limited to the customer’s actual damages. If you are offering either a warranty or a service contract, you must have written agreement beyond the buyer’s guide. The buyer’s guide is meant to be a disclosure, not a warranty or service contract. Under federal law, a written warranty shall include the following information: (a) name and address of warrantor(s), (b) party/parties to whom the warranty is extended, (c) parts covered, (d) statement of what warrantor will do in the event of a defect and how long they have to do it, (e) a statement of what expense, if any, the consumer must bear, (f) exceptions and exclusions from coverage, (g) dispute settlement procedure and general description of remedies available, (h) period of time the warranty is valid, and (i) period of time in which warrantor will perform warranty obligations. Federal law does not provide requirements of a service contract, but the service contract should have similar terms disclosed as the warranty. If you are unclear whether you are offering a warranty or a service contract, call your attorney or Allison Harrison at (614) 440-1395.
loses 20 percent of its value in the first year of ownership. That means a $30,000 new car will be worth only $24,000 just one year later. Naturally, any vehicle will continue to depreciate as it ages, but it can be at a much slower rate. Certification allows the customer to buy an “almost new” model for less, which will better hold its value until they’re ready to pass it on to the next owner. And they can enjoy this advantage without worry because although the vehicle is older, it is of certified quality. And who wouldn’t return to a dealership that was able put them into the car of their dreams without the usual worries of a used car purchase? With the knowledge that they’re covered by a limited warranty? Secure they’ll never be stranded at the side of the road? And with the reassurance they’ll have a ride to work even if the car is in the shop for a covered repair? I know I’d be a customer for life, and I’d send my family. Danny Delich is senior vice president at Peak Performance Team. READ & RESPOND CERTIFY BELOW Complete this test and certify below that you have read the articles for April 2019. True/False: With built-in artificial intelligence and machine learning, you can find the right car at the right price, in a transparent and fair process, all in about an hour. Which of the following is a possible reason why your Facebook page is failing? (a) Y  our page lacks the human touch. (b) You don’t fully understand your target audience. (c) You have no defined goals. (d) All of the above. True/False: Facebook Insights (your page analytics tool) gives you all the metrics you need to judge how your page is doing. True/False: Partnering with a service contract provider that has the tools in place to take care of your customers the way you’d want them treated is perhaps the most important thing you could do to protect your reputation when your customer’s experience is out of your control. True/False: A “service contract” is a writing to perform, over a fixed period of time or for a specified duration, services relating to the maintenance or repair (or both) of the vehicle. What is a warranty? (a) Any written affirmation or promise made in connection with the sale of a vehicle by a dealer to a consumer which relates to the nature of the material or workmanship and affirms or promises that such material or workmanship is defect free or will meet a specified level of performance over a specified period of time. (b) Any undertaking in writing in connection with the sale by a dealer of a vehicle to refund, repair, replace, or take other remedial action with respect to such product in the event that such product failed to meet the specifications set forth in the undertaking, which written affirmation, promise, or undertaking becomes part of the basis of the margin between a supplier and buyer for purposes other than resale of the product. (c) Both A & B. (d) None of the above. True/False: Warranties are included in the price of the vehicle and cannot be part of the bargain. A service contract is paid for by the consumer in addition to the price of the vehicle and can be negotiated as to how extensive the coverage is and how much it costs. I certify to OIADA that I have personally read these articles in The Oregon Dealer News Magazine for April 2019. STOP!! Before you sign and send this form, make sure you have answered and completed all the quiz questions to receive Continued Education Credits. OIADA has been representing the independent auto dealers’ industry since 1948 and is the only true state association for independent dealers. There are numerous benefits of membership. • $1,150 in Auction Buy/Sell Fee Discounts • Free Continued Education Credits • Discounts on all Classroom Education • Discounts on Annual Convention (with 6 hours of CE Credits) • Discount on Forms (an average savings of $100-250 per year) • Membership with NIADA and over $16,000 in Discount Opportunities • OIADA Legal Support • OIADA Staff Support For more information, visit www.oiada.com or call 503-362-6839. Join today!